Summarising these findings, we arrive at the picture of an agricultural village population providing labour for a large central project. Unlike Cuicuilco, Teotihuacan cannot have been merely a cult and pilgrimage centre. This becomes apparent when we compare the technological efforts involved in the two projects. At Cuicuilco about 20,000 tons of material were invested against million in the earliest phase at Teotihuacan. While the first could be achieved by a fairly limited number of tribesmen, the second required a well-organised population. And for this a great deal of supporting evidence has been assembled in the last few years. Until recently archaeologists have tended to look upon Teotihuacan merely as a magnificent ceremonial centre, permanently inhabited only by a priestly society and its attendants with a small supporting population. Its ceremonial character is certainly emphasised by the grandeur not only of its pyramids but, even more, by its general layout. The central feature, the Street of the Dead, is 45 m. wide and 4 km. long. 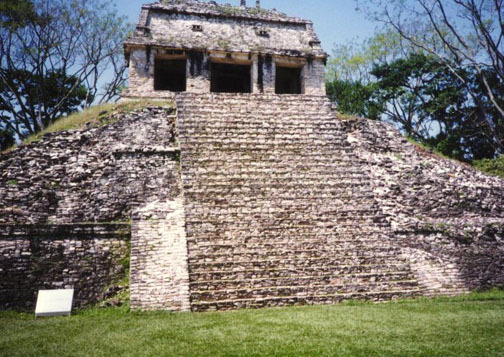 It is flanked on both sides by smaller pyramids which had been mistaken by the Aztecs for tombs. At its northern end stands the pyramid of the Moon overlooking a plaza framed by a number of lesser pyramids. At its western side the palace of the Quetzal butterfly has been recently excavated. The Pyramid of the Sun and its large surrounding court stand a little to the east of the central avenue, and east of its southern end lies another impressive court with the temple of Quetzalcoatl. The last two decades have seen an immense amount of archaeological work at Teotihuacan. I first visited the city in 1951 and hardly recognised it when I saw it again fifteen years later. The Street of the Dead had been cleared in all its length and the Mexican National Institute of Anthropology and History, as well as a number of American archaeologists, had carried out a huge amount of excavation throughout the Teotihuacan area. A survey of all these results revealed the astonishing fact that, far from just being a ceremonial centre, Teotihuacan had been an immense city, housing at the height of its development about r 50,000 to 200,000 people. The urban area covered no less than 20 km.2 of closely-built housing accommodation, workshops, markets and temples. It was a well-planned city, laid out, as the Street of the Dead and its plazas show, on a grandiose scale, teeming with life as early as 2,000 years ago - the first and the most populous urban centre on the American continent. We have said already that we do not know who the Teotihua- canos were. They left no legends, no script and no discernible heritage. They came in the last few centuries bc ; they built a huge city and their influence seems to have spread far beyond the Valley of Mexico into Yucatan. When they disappeared at about AD 600 nothing of the flourishing civilisation was left except the ruins of their buildings. The study and excavation of these provides us with the only information which we have of this vanished world. Here the work has only begun and it is a foregone conclusion that in a few decades we will know much more about the Teoti- huacanos than today. The age of Teotihuacan must have been a peaceful one. There are no signs of fortifications or of a rebuilding of urban districts after destruction by an enemy. Rebuilding was confined to the sacred precincts, and for this we have ample evidence. The reconstruction of the temple of Quetzalcoatl has already been mentioned; it seems that remodelling took place at many other buildings, including the large platforms in front of the Pyramids of the Sun and the Moon. Possibly a religious reformation or a highly important calendrical change may have taken place at about AD 300 which resulted in a new and very severe style of architecture. All the temple facades were remodelled by the introduction of large, unsculptured panels which, by a cunning cantilever construction, surmounted inclined, rising planes. The effect, as we see it today, is most impressive in its monumental simplicity and the uncompromising juxtaposition of bright light and deep shade. The divinities worshipped at Teotihuacan seem to have been the gods of fire, water and wind. The last was later represented by a feathered serpent, Quetzalcoatl, and Toltec legend identified him with an early cult hero, a god of learning who forbade human sacrifice. While human sacrifice was probably practised at Teotihuacan, it does not seem to have been prominent and the evidence for it is thin. Four skeletons of children buried in a sitting position and facing outwards were found under the comers of the temple of Quetzalcoatl, and Laurette Sejourne discovered a large bowl with the bones of a set of upper thighs which she regarded as evidence of cannibalism. It seems unlikely, however, that the Aztec ritual of mass sacrifice existed, since the oldest pyramid, that of the Sun, is far too high to serve as a suitable stage. Human figures at the top appear diminutive when viewed from the ground and the disposal of the victim’s body would have been a slow and laborious process. While we do not know why and how the Teotihuacanos vanished from the scene there are indications that the civilisations of Central America passed through a crisis in the last centuries of our first millennium. Unlike Egypt in its desert-bound valley, Central America was wide open to migrating nomadic tribes from the north. It seems that waves of invaders pushed their way southward; the Toltecs were evidently one of the first. Toltec civilisation has all the trappings of a warlike society, to some extent tempered by contact with the higher culture which it had encountered. Whether the Toltecs themselves destroyed Teotihuacan we do not know, but it is certain that Toltec influence penetrated as far as Yucatan where it impressed its warlike glory of human sacrifice on a peaceful agricultural society. The Toltecs, in turn, were superseded by the savage Chichimec tribes, one of which were the Aztecs. The magnificent city of Teotihuacan arose out of an agricultural village population, and at the very beginning of its history stands the immense Pyramid of the Sun. The parallel with the Egyptian pyramid age is truly compelling. Here, in Central America, and quite independent of Middle Eastern civilisation, villagers had been brought together to erect an immense pyramid, and in doing so laid the foundation of a highly organised community. If anything, the Amerindian pattern of development is even more clear-cut than that on the Nile. Man, after developing agriculture, lived in villages - small units where everybody knew everybody else and everybody else’s problems. As the population density increased, demarcation disputes between villages and tribes became unavoidable. The only way out of this dilemma was a central administration, strong and intelligent enough to keep peace. When we look for the way in which it was brought into being, we discover a strange thing : at the beginning was the great pyramid. It seems that this large-scale co-operative effort was the manner in which the new form of human society, the centralised state, had to be created. Once a few large pyramids had been built, the organisation and welding together of the village population into a new, more diversified, pattern had become an established fact. No further pyramid- building on a gigantic scale was required. Human labour could now be channelled into a multitude of other activities, all of them planned by the central government. The city of Teotihuacan is a memorial to this first large-scale organisation of man on the American continent. Just as the Old Kingdom administrators thought that their pattern of society was so successful that it deserved to be eternal, so the leaders at Teotihuacan must have believed that nothing would change their blessed world. Neither conceived the idea that their superior pattern of life required defence. Both were wrong, but in the end, the new organisations of man, the state which the pyramid had created, survived all vicissitudes.